The task of renewing UUCM’s Mission was identified as a key priority at a New Ministry Workshop in Oct 2016, and it had also been raised in our Survey conducted during the Ministerial Search Process. The previous mission had been developed in 1995. What is a Mission Statement? A Mission Statement is a well-articulated , compelling, inspiring statement that names why a congregation exists. Mission-Covenant, Part 2: What Makes This a Religious Venture? On Saturday, September 23, 2017 forty-five members of the congregation were skillfully led by consultant Linda Laskowski in surfacing the values, memories and meanings that animated them in regard to UUCM. Insight and inspiration from the children and youth started us off with their descriptions of what church and this community means to them. 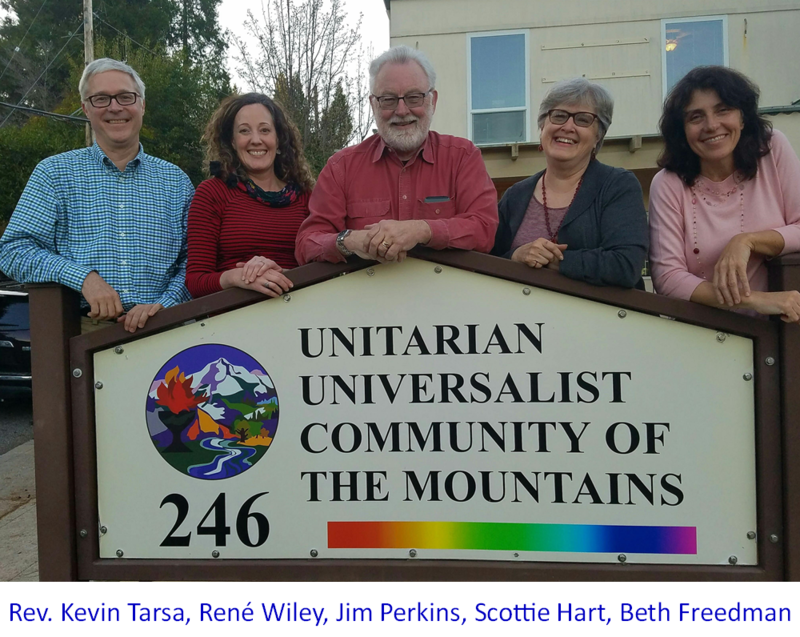 The UUCM Mission Refining Team (Lesley Champlin, Susan Merrill, Gail Johnson-Vaughan, Tom Wernigg) picked up the active work from there, taking all the words, phrases, images and ideas from the workshop, and crafting and initial draft of a new mission statement. The Team then hosted numerous small group conversations in October and early November to garner member feedback, listening for the spirit and tone of people’s responses. With that knowledge in hand, the Team went back to work to craft a second draft. A congregational conversation on Sunday, December 10, offered a large-group opportunity and shared conversation to weigh in on the new draft. Heading back to the drawing board, the Team offered its third and final draft in early 2018, having paired its first two drafts down to the 25 words mission we have today, voted in with near unanimous support by the congregation on February 4, 2018.
to create a world more compassionate, sustainable, and just.